The passage in James is not a lesson about the prophetic spirit of Elijah preparing the way of the Lord. This statement is twisting the words of Scripture. The Matthew passage immediately follows the passage that shows then Pharisees accusing Jesus of casting out demons by the power of Beelzebub. Jesus then gave His definition of the unpardonable sin—blaspheming the Holy Spirit—and accused the Pharisees of this sin. They had been attributing to Satan the work of God. That is blasphemy. Because of the Pharisees unrepentant hearts and their refusal to believe in the face of clear evidence of Jesus’ identity, Jesus passed judgment on them. The last part of Matthew 12 has Jesus explaining that the unbelieving Jewish leaders wanted a sign, but they would not get a sign except the sign of His own eventual resurrection—the sign of Jonah—because of their refusal to believe the clear evidence. Jesus DID do miracles to prove His Messiahship. In fact, the book of Matthew is filled with Jesus’ miracles that He performed for the purpose of identifying Himself. The Jews knew the Old Testament prophecies that the Messiah would cause the blind to see, the lame to walk, the deaf to hear, and the dead to live. Jesus systematically fulfilled those prophecies in the plain sight of the nation, and the hard-hearted leaders refused to believe. They looked right at Him, knew those signs could not be done apart from God, knew the prophecies, and refused to believe. Therefore, in Matthew 12 when they blasphemed the power and the Spirit of God and attributed Jesus’ miracles Satan, Jesus judged them. They would receive no more signs. Instead, as Matthew 13 opens, He began speaking to them in parables. He was not trying to make things clear; He was obscuring the truth. His parables were a judgment on the unbelief of the Jews. He told His disciples that only those with ears to hear would understand. Had He continued speaking clearly to persistent unbelievers, He would have been increasing their guilt. He was fulfilling Isaiah’s prophecy of chapter 6 that they would hear but not understand, see but not perceive, and that their hearts would be dull. Jesus’ miracles were directly related to revealing His identity. Sunday’s lesson misses the non-negotiable command of Scripture to give thanks in all circumstances. While the author quotes Ellen White and makes the case that praise and prayer are important whether we are suffering or happy, that obvious commentary misses the point. Jesus commands us to pray always, unceasingly, in all circumstances, and to be anxious for nothing (Phil. 4:6-7). This command is meaningless apart from knowing Jesus. Unless we have been born again, habitual prayers are mere formulas, rituals we perform as hopeful means of grace. Scripture, however, declares that we who are alive in Christ are sinning if we indulge in worry and anxiety. God commands us to be anxious for nothing, to pray always, to pray that we may speak the gospel as we ought (Col 4:2-6), and to give thanks always because of the fact that God is sovereign. We do not move God nor change His mind; we are asked to trust Him. He promises to take care of us and be with us, never leaving us, and that His power is made perfect in our weakness (2 Cor. 12). Whereat trust Him and lean on Him, submitting to Him, in every circumstance. Our emotions, our bodies, our confusion, our needs, our joys—these are all things we entrust to Him and give up our “right” to control. He is faithful; we are to trust Him, and we are to submit our minds to His word. Prayer and praise aren’t “good disciplines” that are good for us. That’s far too shallow. They are the acknowledgment of who God is and of our security and trust in Him when we are His. These lessons address James’s command for the sick to call the elders for anointing and prayer. This passage directly links physical healing with spiritual healing. In fact, many commentators believe that the point of this passage is that if people are sick because of sin in their lives, they are to call the elders for prayer for forgiveness and healing. The command seems clear: the sick are asked to call the elders for prayer, and God will deal with both the physical as well as the spiritual restoration needed. This passage, however, does not promise that God will always heal. The New Testament is full of examples of God not granting physical healing but of demonstrating His power and faithfulness. Paul’s famed “thorn in the flesh” is a prime example. 2 Corinthians 12 tells the story. He had been shown surpassing things he was not permitted to tell. He had been taken to “the third heaven”, and to keep him from becoming conceited, God gave him “a messenger of Satan to torment” him (v. 7). Paul begged God to remove the affliction, and God’s only answer was, “My grace is sufficient for you, for power is perfected in weakness” (v. 9). It is important to note that in some way we cannot explain, but in a clear example of God’s sovereignty over Satan, both God and Satan were involved in this torment. God sent “a messenger of Satan” to him keep him continually leaning on the Lord Jesus. Paul had look beyond his suffering to the Lord who was sovereign over that suffering and depend on Him. He had to submit to his circumstances and realize that God was revealing His own power and sovereignty to him in this circumstance. Another point the lesson makes on Monday is that the paralyzed man in Mark 2 received Jesus’ healing and forgiveness because spiritual healing was uppermost in his mind. The lesson also states that this incidents to point out to the people their deeper need of salvation. The passage in Mark 2 reveals a completely different reality. In this incident, Jesus is revealing His identity as the Son of God. The Jews knew that only God can forgive sin. They also knew that only God could make a paralyzed man walk. Jesus was demonstrating that the two were equally “impossible” except as acts of God. He was showing that He was the Messiah. Interestingly, to demonstrate that it was no harder to command a man to walk than to say one’s sins were forgiven, He linked the commands with the opposite effects. When He saw the faith of the men who brought the paralyzed man, He said “Your sins are forgiven” (Mark 2:5). He revealed their unspoken thoughts that accused Him of blasphemy, asked them which was easier to do—declare a man able to walk or forgiven—and then stated that His evidence to them that the Son of Man has authority to forgive sins was to command that paralyzed man to “pick up your pallet and go home” (v. 11). This story has nothing to do with revealing the need of salvation nor of addressing the man’s unspoken desire. It has everything to do with Jesus revealing His own Messiahship, His authority over sin and physical illness and the plight of humanity. He was revealing Himself as God—and the Pharisees knew what He was doing. On these days the lesson takes a turn. Here the writer turns to Elijah and begins to make the point that Adventists are like “Elijah”. This is simply not true. The point of James’s teaching on prayer is to explain how born-again believers are to bring their entire brokenness to the Lord for His healing, power, and redemption. Believers are to pray in all circumstances, but they are to understand that the Lord Jesus is sovereign and faithful. He determines what He will heal, when He will sustain—but in all of it, He is present and upholds us with His power. These promises are not for unbelievers. People who have not placed their faith in the Lord Jesus and His shed blood cannot hope to have Him intercede according to their perceived need. Their response should be one of repentance and submission to the Lord Jesus as Savior. For Adventists to identify themselves as the modern-day Elijah and John the Baptist is the height of arrogance. Adventists do not teach the biblical gospel. They identify the investigative judgment and its demands as the core of the gospel, the “three angels’ messages” which is “the gospel un verity”. This teaching is entirely a fabrication of Ellen White and has no place in Scripture. Adventists are a counterfeit “church”. They are not the remnant church of Bible prophecy. To claim to be the modern John the Baptist who ushers in the coming of Jesus is false and is entirely untrue. 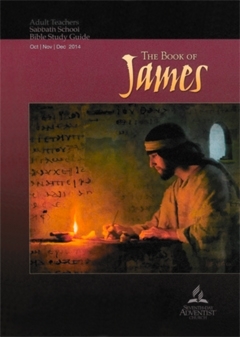 Instead of reading Ellen White, I challenge the reader to read through the entire book of James at one sitting. Ask God to show you what He wants you to know, and allow the words to mean exactly what they say. Remember that James was writing to Jewish believers, that he wrote before Paul’s epistles which explained the administration of the new covenant, and that James was explaining to these scattered believers how to live by the “royal law of Scripture” which is not the Ten Commandments. James was explaining to people who had learned the law intimately how to live by trusting God with their emotions and needs. He was explaining to them how to live by trusting the Lord Jesus and living as people who had already been brought from death to life.